Sure, they were looking to become the first team since the 1987 Boston Celtics to reach the NBA Finals in four consecutive years, as well as the first team to three-peat since the 2002 Los Angeles Lakers, but you already knew that. Besides, talking about Bradley Beal's early season development and the new-look Sacramento Kings is just a lot more fun! However, the Heat are entering—if you want to be dramatic about it—a crucial juncture in their season. Miami has played 44 games and are 32-12. At the same point last season, they were 30-14 and many pundits were suggesting that the Heat were coasting and just waiting to "flip the switch" or "put their foot on the pedal"; just two sports clichés that truly have no meaning any longer because people like Tony Kornheiser (and I love Tony) beat that kind of rhetoric into the ground in midseason panic rants meant to drum up conversation. However, last year, after defeating the Toronto Raptors in the forty-fourth game of the season on February 3, 2013 the Heat then went on a 27-game win streak and looked unbeatable. From there, we know the rest of the story: they stumbled into the Playoffs, sleepwalked their way to the Eastern Conference Finals, barely hung on against Indiana, and then fought for their lives to defeat the Spurs (with more than a little luck) in perhaps the best NBA Finals of all-time. So, to quickly review, the 2013 Heat were two games worse after 44 games than the 2014 Heat. After their early season "coasting" period, they went on an historic winning streak, stumbled into the Playoffs and barely won the NBA Championship after two incredibly hard fought series. Here we are in 2014 and everyone is once more panicking about the Heat. Already pundits (again, people like Tony Kornheiser) are already predicting that LeBron will leave the team in free agency whether or not the Heat win the title. (Hint: He’s not leaving. Where the hell would he go? Seriously, just think about the options. There are none.) We are past the halfway point in the season, so I understand the inclination to scrutinize the Heat; I get that it's easy to lecture them on TV and radio shows about how waiting to "flip the switch" is dangerous; and I completely understand that the Pacers are loaded, dangerous and playing a fantastic brand of basketball with a potentially all-time great defense. But isn't anybody else bored with predicting the end of something before it happens? It's not original or interesting for me to say that in this Twitter culture we have developed an insatiable hunger for headlines to feed us openings for snarky remarks and opportunities to be offended, but it's true. Sports media may just be the worst offender. We look to close the door and define team and player legacies before those teams and players even have time to undergo the ebbs and flows of the actual time and era that they are playing in. Things move fast. Content is king. I get it. But even if you hate the Heat, you always miss a good bad guy when he's gone. You don't even have to be a professional wrestling fan to know that's true. 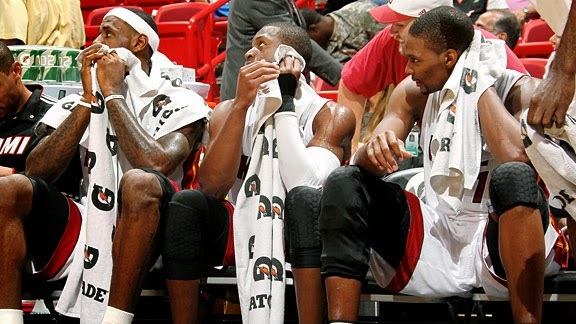 The Heat are the most interesting team this week because they just beat down the Spurs in Miami on Sunday. Wade wasn't fully healthy and the Spurs were missing Leonard, Splitter and Green. The rotations weren't anywhere near normal. The game kind of meant nothing. However, Greg Oden is progressing nicely and starting to see his minutes methodically increase. On Wednesday, the Heat host Oklahoma City Thunder in another test against a contender. But Westbrook won't be playing in that game and, despite how historically well Durant is playing, that game won't really mean anything either, despite what anyone on TV says. However, over the next month the Heat play the Thunder one more time; play at the Clippers, at the frisky Suns, at Dallas, and at Golden State. Starting on Wednesday through March 9th, ten of the sixteen games Miami plays will be against teams with winning records. Let's check in again on the morning of March 10th and see where things stand then, with that stretch of games behind the Heat and the Playoffs beginning to come into view. Unfortunately, Twitter and the world continue and never tire. Wade's knees are still a problem. LeBron still has to carry a heavy burden and is not shy about mentioning that to the media. The defense is not where it needs to be. Pointless news bulletins about LeBron tweeting or taking an Instagram and what that means to his future will be become more prevalent. But let's just enjoy the “team of the moment” as they look to make history. The era of the Miami Heat as the top team in the league will be over faster than you know it. Enjoy the moment for what it is, because everything ends faster than you want it to. I know all too well. Laying in my bed on Sunday, more hung-over than I could have imagined, I watched Dwayne Wade come off the bench against the Spurs. Wade is my second favorite player of all time and I have been in denial about his health and fading abilities. With my mouth dry, my head throbbing and feeling like my life was in total disarray after a night of too much fun, I realized for the first time that I really won't be able to watch Wade play basketball that much longer. And I thought of the passing eras of the league: of watching the Jordan generation end, of seeing players like Tracy McGrady and Allen Iverson sadly leave the league, of how soon Kobe, Duncan, Garnett, Pierce, Nash and Allen will all be out of the league. I felt mortal and wished I hadn’t drunk so much. Even though I may be biased because I like Wade and think that having a team like the Heat in the league is important, the lesson remains: don't always rush to the end. The next thing isn't always the best.